The National Hurricane Preparedness Week has been in full swing this year getting the public ready for the start of hurricane season. 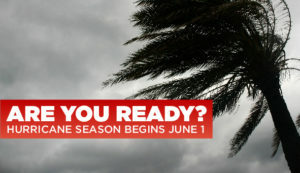 June 1st marks the official start to this season and as the winds start to howl and the rain plummets we should talk about how you should prepare your home, your family, and your pets for a natural disaster. Caring for animals is a full time job and with that care there is love and affection between an animal owner and the animal. 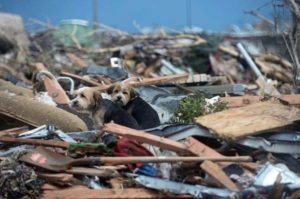 While we are talking about natural disasters there is one key that needs to be brought to every animal owner’s attention: when animals get frightened they PANIC. Animals feel a wide spectrum of emotions and generally what happens is that when an animal is frightened they seek out comfort and in these instances this should be you. 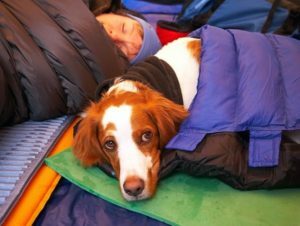 Never in a natural disaster leave your pet behind. It is your duty as the caregiver to these animals that you ensure their safety. That being said here is a good way to prepare for the season ahead. DO NOT WAIT! Get ready now with preventative measures. ID your pet. Chip your pet. Photograph your pet. 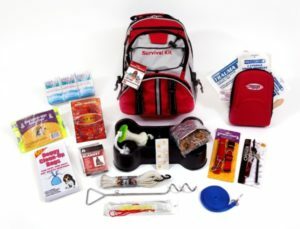 MAKE A DISASTER KIT. The basics for both you and your pet include food and water for at least 5 days, medications and medical records (keep these is a waterproof container), and keep your first aid kit fully stocked. Cat litter box, scoop, litter and plastic bags to collect waste from your pets. Include leashes, harnesses, and pet carriers in your kit. Also, it is important to keep current photos of your pets and loved ones. Don’t leave anything out when you compile descriptions about everyone in the house include medical conditions, emergency contact information, doctors and veterinarian contacts, and for pets their feeding schedule. SAFE PLACE: find an alternative place to stay ahead of time that can accommodate your family and pets. EVACUATE: If you need to evacuate DO NOT leave your pet behind. They are counting on you to get them through this trying time. STAYING PUT: Protect yourself and your family. Be cautious and stay safe.